He brought home a watermelon. I was craving fruit and he brought me a whole watermelon. 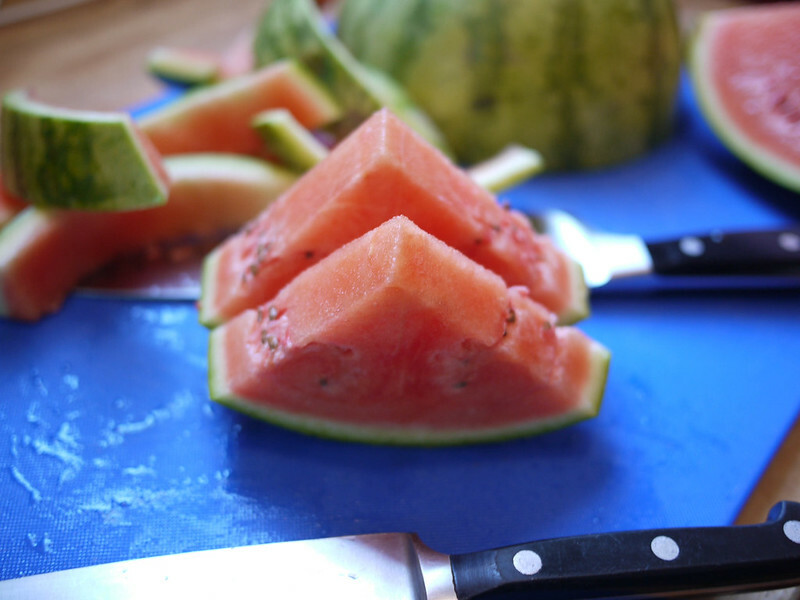 A whole watermelon isn’t an extravagance in the scheme of things. But if feels extravagant. And somewhat like that old joke where eternity is defined as a ham and two people. But I took to carving it up and made a big fruit salad that lasted for days. And while I was at it, I peeled the rind and chopped that up, soaked it overnight, simmered it until tender, simmered it in spiced syrup, and put it in jars. It won’t last until eternity, but maybe at least until midwinter. Which, at this moment, feels a blissful eternity away. I got this recipe from the gorgeous book, The Glass Pantry, which I don’t use anywhere as often as I ought to. Peel the skin from the rind and scrape the rind free of any flesh. 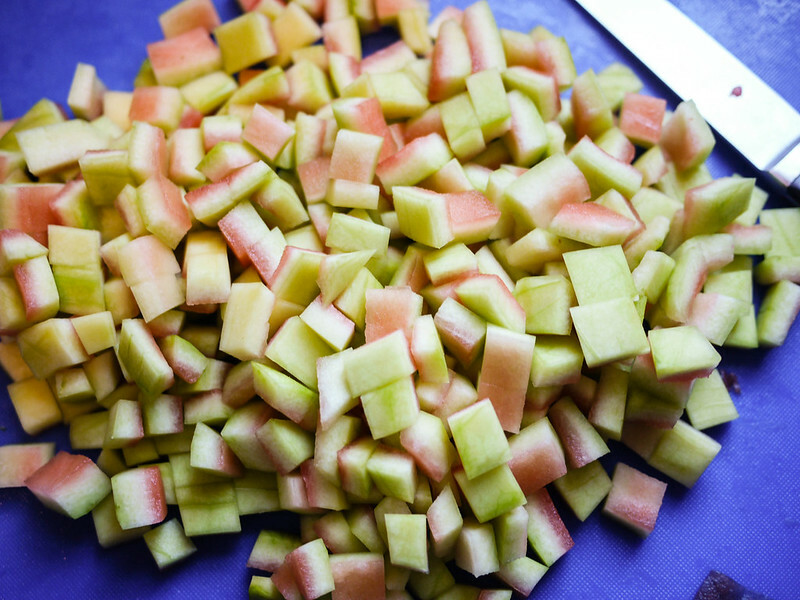 Cut the rind into 1/2-inch pieces. Combine 4 quarts of water with the salt in a large bowl, and stir to dissolve the salt. Add the rind to the salt water and let soak overnight at room temperature. The next day, drain the rind. Place the rind in a stainless steel or other non-reactive saucepan with 2 cups of the remaining water and bring to a boil over high heat. 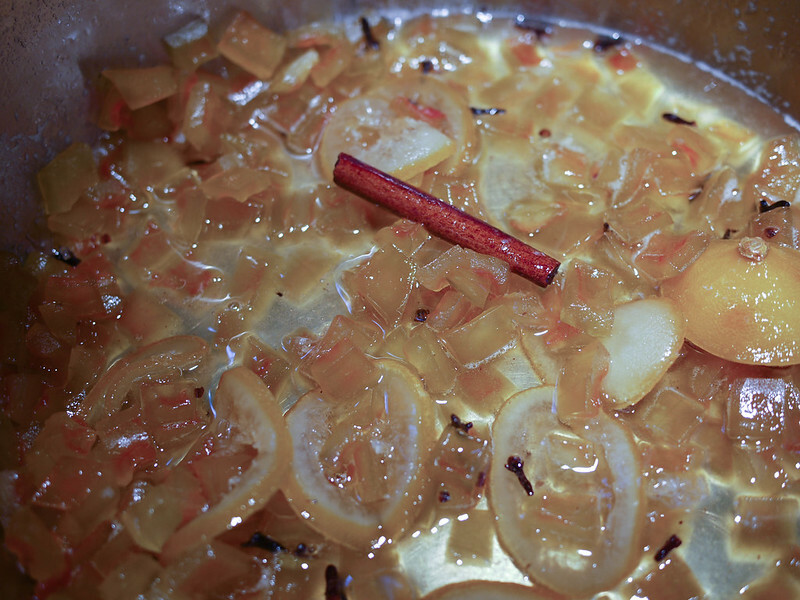 Lower the heat and simmer until the rind is just tender when pierced with a fork. Depending on the thickness of the rind, this will take anywhere from 20-50 minutes. In a saucepan large enough to hold the rind eventually, combine all the remaining ingredients (sugar, lemon, cinnamon stick, cloves, and remaining 2 cups of water). Bring the mixture slowly to a boil, stirring to dissolve the sugar. Boil until the sugar dissolves and a syrup forms, about five minutes. Add the rind to the syrup and cook over low heat until the rind becomes transparent, about 20-30 minutes (timing will, again, depend on the thickness of the rind). Remove the lemon slices and cinnamon stick. 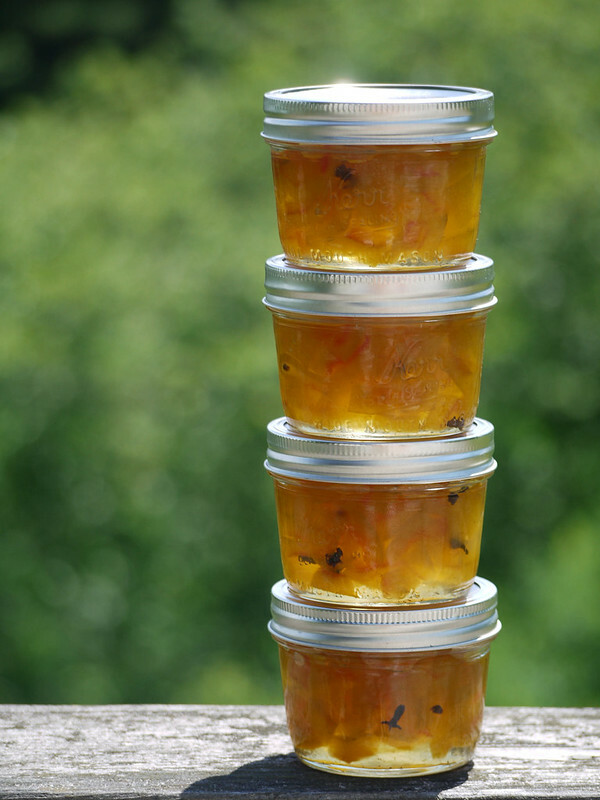 You can now pack the rind and syrup in jars and process in a boiling water bath for 30 minutes, or put in jars and keep in the refrigerator for shorter-term keeping. LOL on the ham and two people equaling eternity. Your photos are so lovely, I especially love the ones of the dish and jars as you can capture glass so nicely. Ya know. 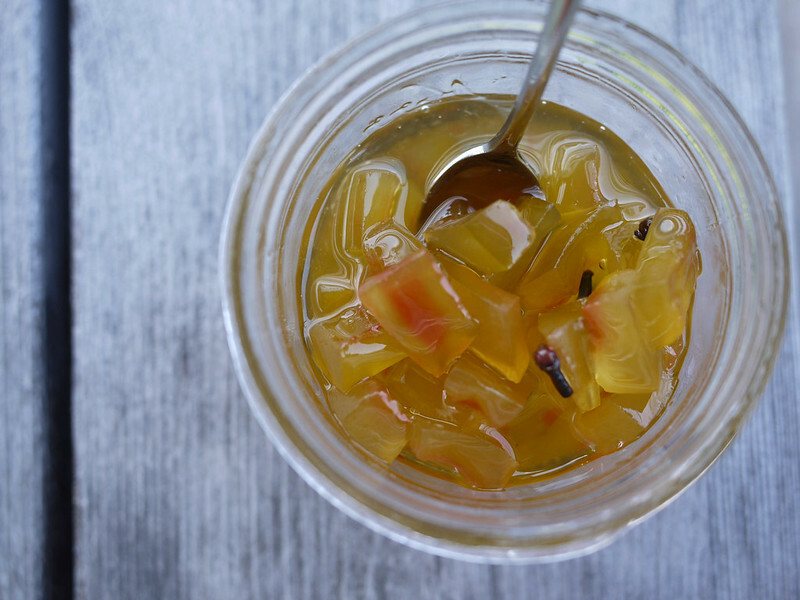 I have never made/had watermelon rind pickles. ANd we have tons of watermelons every summer. I will have to try this. You should! This recipe is sweet, sort of like a chutney. 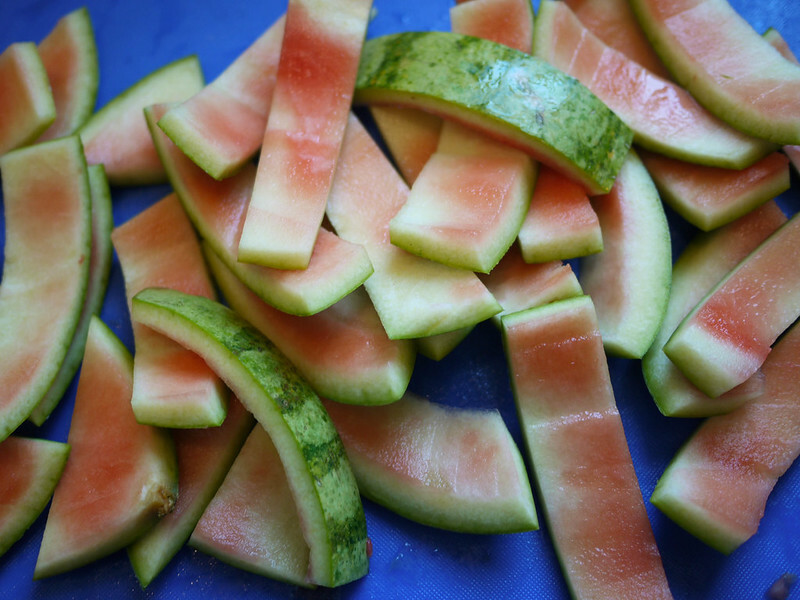 I’ve also had just plain pickled watermelon and it’s also wonderful, so do that, too! Oh my…I am so in love with your photography! Beautiful captures! Can’t wait to see more!